As a child of professional musicians, Joel grew up with music as a way of life! Joel studied under Dusan Bogdonovic at the San Francisco Conservatory of Music, where he earned a degree in classical guitar. Joel has provided customized guitar music for weddings, parties and events in the Asheville, Raleigh-Durham and Atlanta communities since 2002. 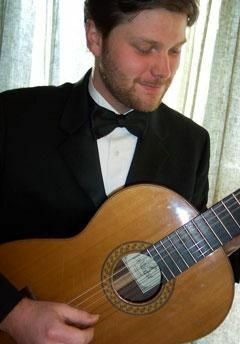 Joel is excited to share his talents with you and your guests! To contact Joel, please follow the link or fill in your contact information below.